As we hit the 7th week, the LCS Season 8 Spring Split is only getting more tense from now on. Only six matchdays are left for the European teams in the regular split, while the Spring Playoffs 2018 are just around the corner. We are more than excited to see who the regional champion that represents Europe at the MSI 2018 will be. Even bets and betting odds are already available for the League of Legends World Championship 2018. Teams like Schalke and Misfits have not played to their expectations and have to fiercly fight for the highly appreciated playoffs seed. While Fnatic is now sole leader of the standings, G2 is still the second favorite for the LoL League Championship title. H2K and the Unicorns of Love have both improved over the last two weeks and are signaling that they are not out of the playoff race yet. Week 7 of the EU LCS Spring Split starts on March 2nd at approximately 6:00 PM CEST but you can also take a look at the full EU LCS 2018 schedule to never miss any games of the split. Fnatic has finally claimed the head of the table for themselves after the victory against G2 Esports. To keep their lead, they now have to win the matches against the Misfits and Team Vitality. G2 on the other hand has a fairly easy schedule, but the last weeks have shown that everyone can beat anyone in EU LCS. The teams are all pretty close to each other in the standings, the last placed teams are only two points away from playoff ranks. Vitality has now lost four games in a row and need to end their losing streak, but they will meet Schalke 04, who urgently need some wins in order to even reach the playoffs. This game will be one of the most interesting to watch this week. If you haven't noticed already: Shook is starting Jungler for H2K. Of course our renowned eSports betting sites are also involved in the EU LCS Week 7 with the best bets and betting odds, so you'll always find a comparison of the best online betting sites and odds right here. The G2 Esports team is also the big favourite among our online bookmakers, although their winning streak has ended against Fnatic. As always, betting odds may change due to player exchanges or illness, in case of doubt follow the links on this page to the websites of the online betting providers to always keep yourself up to date. You will find detailed predictions and analysis of the upcoming matches of the EU LCS Spring Split 2018 – Week 7 right before the first game of the week. Prediction: The first game of the evening officially kicks off the fight for the playoffs. Neither team can afford to miss this so important point. Roccat cannot be satisfied with finishing 7th in the standings after a strong start into the split, but only one point separates the team from the Giants. Giants Gaming had won the first leg, but I think Roccat have now gained stability, so I'm expecting a 1-0 victory for ROCCAT. Prediction: Last vs. last – the duel between H2K and Unicorns of Love promises anything but high-class League of Legends. But the tension will not be lacking in this match, both teams are in an uptrend and want to play for the playoff seeds in the next few weeks. Due to the strong last weeks of both teams it's hard to find a favourite here and the bookmakers see both teams at the same level. I think the H2K players are tactically better adjusted and their macro-play will make the difference, so I expect a 1-0 victory for H2K. Prediction: G2 Esports lost to Fnatic last week, but the quality of the team is still undeniable. Participation in the playoffs is almost certain for G2, everything else would be a huge embarrassment for the King of Europe. Splyce, on the other hand, still has to fear for a playoff seed. 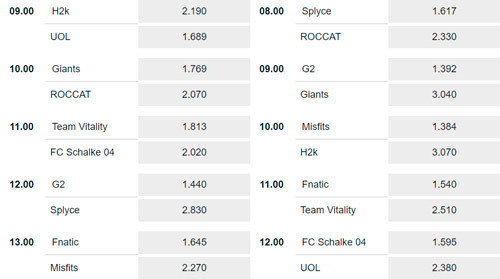 Fun Fact: Since the start of the Spring Split in 2018, Splyce has achieved a score of 1:1 every week, and after they play against ROCCAT on the second day of play, I think they will use up their obligatory defeat on the first day. Therefore, and because of the enormous quality at G2, I expect a 0-1 victory for G2 Esports. The match Vitality vs. Schalke was originally planned as the top match of the day, but due to the weak performances of both teams, the match was brought forward by one hour. While Schalke has been showing problems throughout the split again and again, Vitality started well and the team led the EU LCS table for a long time. But the last four games all brought defeats for Gilius and his team. It was almost as if the defeat against G2, where Vitality was completely overrun, had broken the morale of the players and robbed them of their winning mentality. Schalke's players therefore have to take their chances, because if they can't beat Vitality in their current condition, they probably don't deserve the place in the playoffs either. Last week at Schalke versus Misfits you could see exactly why the team was hyped before the split. When AD-Carry Upset becomes active and works with his team, he can decide fights on his own. After the game it was shown that 45% of Schalke's total damage came from Upset's cannon. But also another aspect became clear in this game – Schalke can react well to the opponent (Trundle-Pick as an answer to Sion) and read the game situations very well. When Misfits turned to the elder drake, Schalke decided to teleport themselves into the enemy base with Ryze's realmwalk and end the game easily. Prediction: I don't think Vitality will be able to recover its old form so quickly and will have to fear for the playoffs at the end of the split. Schalke is not allowed to make any more mistakes in the next few weeks, because missing the playoffs would be very painful for the players and the fans. 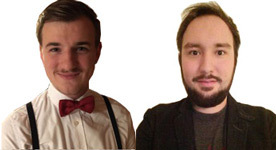 I therefore expect a 0-1 victory for Schalke 04 Esports. Prediction: Riot has decided that the top game of the week will be called Misfits vs Fnatic. While Fnatic took the lead in the standings last week, it looks gloomy for the Misfits. 2 victories in the last 4 weeks is a poor achievement, but if you look a little closer, you'll find that one of those victories took place in the first leg against Fnatic. At that time, in week 3, the EU LCS had slightly longer playing times, and so the fans got to see a 64-minute game in which Fnatic was in control most of the time and could hold all inhibitors for over an hour, but a single fight won enabled the misfits to tear down the enemy nexus. Meanwhile, the meta has changed somewhat and the games have become faster, a similarly long game can't take place any more just because of the strengthened baron and elder drake buffs. How exactly the change of the AP items will affect the game and which of the two Mid Laners will benefit more from it is still unclear. However, the trend speaks clearly for Fnatic, as Caps and Rekkles have been in top form in recent weeks and are perhaps the best carry duo in Europe. But on Bot Lane, however, Rekkles has no easy task, Hans Sama has also developed into a top ADC and would like to show that he is the best one. Prediction: I see the advantage of Fnatic especially in the Mid Lane, where Sencux has not yet been able to perform at the same level as his predecessor. Caps, on the other hand, is in great shape. I'm happy to see Hans Sama and Fnatic in the duel, but I think no matter who wins the Bot Lane, Fnatic will have the high ground. That's why I expect a 0-1 victory for Fnatic. Prediction: Don't make the fans angry, neither the own nor those of the opponents – this seems to be the motto of the Splyce team, because even with one victory and one defeat in each match week, you somehow reach the play-off stage of the spring season. The performances of the Splyce team vary a lot, defeats against the leaders of the standings Fnatic and the improved Unicorns of Love are no shame, but the chances of a victory in the playoffs are not even expected by the Splyce fans. Team ROCCAT is also not running according to plan at the moment, two bitter defeats had to be booked in the last week and the faster game of LoL Patch 8.4 is supposed to fit Xerxe and his team mates much better. After a likely defeat against G2 Esports, the Splyce team will have to match the score on day two to stay on playoff course – so I expect a close 0-1 victory for Splyce. Prediction: The Unicorns of Love would like to work their way up from last place in the standings with an impressive winning streak, but apparently they are still stuck in the quicksand despite three consecutive victories. Because even the competition doesn't give up and it seems that – apart from G2 Esports and Fnatic – everyone in the EU LCS can beat anybody at the moment. After the Mid Laner with the Unicorn jersey was heavily criticized in the last weeks, Exileh delivered an impressive show in week 6 and could decide games almost on his own. Even a play-off seed is something the team can dream of, but it's still a long way to go. The much-hyped challengers in Schalke 04's team should slowly bring the boat back on track, at the moment they are a victory away from the important sixth place in the standings. The Unicorns of Love are a few places behind Nukeduck and Co. in the table, but due to their recent performances I expect a narrow 1-0 victory for the Unicorns of Love. Prediction: Since H2K Gaming has rebuilt the League of Legends roster, Selfie and his team mates have been on an upward trend, winning three out of the last four games, but unfortunately they have not been able to make up any ground in the standings. Even the Vitality team was not a challenge in the meantime and had to leave summoner's rift with another defeat. Misfits, on the other hand, have shown strong performances in the early stages of the game, but have been unable to keep up with the rotation and strategy of other teams in the late game. At the beginning of the season they could rely on Hans sama, who played scaling AD-Carrys to win a few games for the Misfits on his own, but since the nerf of Kog'Maw the superstar suffers under the bans of the opponents. The new patch could get Sencux and Co back on track, I expect a 0-1 victory for the Misfits. In the top match of the day, the leaders of the standings and the third-placed team will meet in the summoner's rift, but according to the latest results of the EU LCS, the question of whether this duel will be a real tension. Not only did Team Vitality have to give up the lead of the standings after a long time, but after four defeats in a row even Gilius in the jungle refused to trashtalk other teams. Italian Stallion “Jiizuke” in the Midlane has so far been particularly convincing with the Champions Zoe and Ryze, but since the first one's nerf, the aspect of twilight is likely to be seen less frequently in the professional game. The performances of the otherwise brilliant Bot Lane also leave a lot to be desired, Minitroupax and Jactroll were simply outclassed in some matches. The emotional team can be carried far on a winning streak, but the otherwise heated battles of the team within the last few weeks have been rather lazy and unmotivated. The Vitality team of psychologists will therefore have a lot of work to do to get the exceptional players back on track. At Fnatic, everything is running smoothly at the moment, with a victory in the top match against G2 Esports, Rekkles and Co were able to secure their sole lead in the standings and a place in the top 2 of the regular season and the associated walk-through in the playoffs is already almost certain for the team. If the team can't be overwhelmed in the early stages of the game, then nothing stands in the way of victory for the european number one. Prediction: Everyone wants to get the best out of patch 8.4 and the Fnatic team is actually very skilled at quickly analyzing important aspects of a new meta game and being one step ahead of many opponents. Team Vitality is still at a low point and having to face the leader of the standings won't make things any easier for Cabochard and his team-mates. I expect a 1-0 victory for Fnatic. Prediction: Only one or two good fights have been missing for G2 to secure the top spot alone, but Fnatic made a great comeback in last week's top game and turned the early lead of G2 Esports into a win for themselves. Nevertheless, Perkz and his team-mates are still favorites for the Spring Split crown, especially Toplaner Wunder may have the best season of his life. Hjarnan and Wadid are not quite on the same level as their predecessors Zven and mithy, but they are among the best botlanes in Europe and are very experienced. Surprisingly, the Giants are still in the upper spheres of the table, but after a defeat series Betsy and Co continue to slip further and further. In the last game of the week I expect a 1-0 victory for G2 Esports.